All you need to know about -48 power switching. How can I view the default password without HDMI? What is the root password? What 5V power supplies do you suggest? Do I need 12V also? How do I switch back to the GUI from a terminal? Can I reinstall the default OS? What files does DLI provide in the AtomicPi Image? How do I install another operating system? 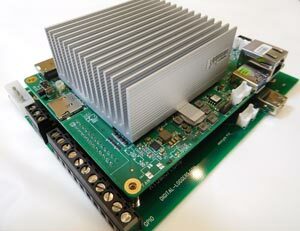 How can I determine the installed Atomic Pi version? What are the processor board specifications? Can you release the processor board schematics? Have image files for processor board? Image files for large breakout board? What's the difference between the baby and full-size breakout? What's the power I/O connector pinout? Crash on GPU start or when USB hub is attached! What are the mating JST connector part numbers? What's the Genesys SD Card Interface chip spec? Where's the Wired Ethernet Chip Datasheet? Where's the WiFi Chip Datasheet? How can I setup WiFi? Where's the Bluetooth Interface datasheet? What's the XMOS Digital Audio Processor? Where can I order an XMOS JTAG programmer? How can I build an xTAG3 programming cable? How can I reset the XMOS and enable the I2S MIC inputs? Board outline in PDF format? Suggested Power Supplies & Connectors? Where can I find the AMP Mate&Lock power connector? What are the mating connectors for the CPU card? What antennae do you recommend? A: When you boot into the GUI, it will be in the center of the screen in recent versions. In all versions, you can use CTL-ALT-F2 to open a window. Log in with user: atomicpi and the secure default password shown on the screen. Press the Tab key at the AAeon BIOS Splash. This brings up the familiar AMI-type BIOS display and then you can press Esc or Del. If using a mouse and you're fast enough you can move the cursor to the 'Setup button' in the upper-right corner of the screen and left-click that, but that method can be a bit clunky on a wireless keyboard or touchpad. A real mouse works best. Q: If I don't have an HDMI monitor, how can I see the password? Where's the debug port? If you have a large breakout board, use the serial-USB debug port marked CN1 DEBUG USB. Otherwise, a 3.3V TTL to USB cable to CN10 will work fine. The board comes up at 115,200 baud. Linux can be reconfigured to use other ports for debug.. Jumpers JP1 and JP2 should be set towards the CH340 marking to enable the TTL-USB converter. Q: Is HDMI audio supported? A: Yes, HDMI is the primary audio output device. A secondary system based on the XMOS audio processor is also available in some operating systems. The XMOS drives a class-D stereo power amplifier. Q: What is the physical size? A: The CPU and breakout board measure 5.985 x 4.755 x 1.980" including the breakout board, excluding the rubber feet. A: There's none (root can't log in). If you need one, set one up yourself, e.g. Normally, people log in as regular users and use sudo/super/whatever to temporarily gain root privileges. This is better from an audit perspective. We understand that some desktop apps might still ask for the root password., but the vast majority can be made to use sudo. There is no current reason to have a root password in the first place (if only an extremely long one written on a sheet of paper tucked away somewhere for a case where the OS is so broken that it denies all logins except for root). On the Atomic Pi, the password for root is not set in Ubuntu which leaves root login is disabled by default. The user account created during Ubuntu installation (atomicpi) is associated with all sudo capabilities. Q: Can I get the default OS installation, so that I may reinstall it? A: Yes! We have some full and bare-bones images available here. These are not installers, but stand alone images. Boot from a USB or uSD card and use dd to copy the image. Use BIOS settings to change the boot order. Q; How can I reset the XMOS processor? Q: How do I install another operating system? A: You can install a new OS via USB or SD card or LAN. Use BIOS settings to change the boot order. Q: Do I need 12V also? A: The only reason to supply 12V is if you want to run the class-D audio amp at its full power 2x5W. The amp will produce about 1.5W/ channel running on 5V. Most people use HDMI audio out. In that case the amp power can be left off to save energy. Q: How can I determine the version I'm running? Q: What antennae do you recommend? A: Selection depends on your needs. Aliexpress.com has a good variety. You can choose single or dual-band WiFi antennae, omni, directional or yagi antennae will work fine. Polarized antennae are available. U.FL to RP-SMA adapter cables are handy and inexpensive. The Mediatek WiFi chip supports 2-antenna diversity. No antenna is needed for very short range operation (a few feet). Q: What is the difference between the large breakout board and the "baby breakout" board? A: The "whole enchilada" is a big breakout board with large screw terminal I/O, prototype area, USB<->TTL debug, etc. It's intended for use as a development platform. See the V2 schematic here. The "baby breakout" is really just the 26 pin connector and a 2.5mm barrel connector for more convenient power input. Schematic here. If we haven't answered your questions, please call (408) 330-5599 or send email. We're glad to help. (c) Digital Loggers, Inc. 2019.